Outlined below are the usage rules and policies of Fullerton College and the Theatre Operations Office. Strict compliance is requested from both campus and community based groups. There may be additional rules outlined in the estimate. Parking on campus is by permit only and enforced seven days a week. Please obey all posted Parking Regulations. Please visit http://campussafety.fullcoll.edu or call 714-992-7080 for the current ’Parking and Traffic Rules and Regulations”. Driving of vehicles on campus is strictly prohibited. Loading and unloading of scenery, costume, props or equipment may be done in designated loading zones only. Fullerton College is a Smoke Free Campus. Smoking is not allowed anywhere on Campus. If smoking is required for performance purposes an Open Flame permit must be obtained from the Fullerton Fire Department. Our staff reserves the right to delay or cancel the start of any event if the audience in attendance exceeds the venue’s seating capacity. All audience members must be seated before a performance begins. Open Flame and Pyrotechnics of any kind are prohibited without an Open Flame Permit from the Fullerton Fire Department. All scenery and drapery must be treated with a California State approved fire retardant and proof supplied upon request from the Building Supervisor. 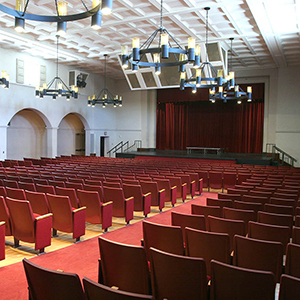 All equipment in any Fine Arts facility may only be operated by Fullerton College staff or trained students with proper supervision of Faculty or Staff. Minimum staffing requirements are in place for all rentals in our facilities. The use of equipment not provided by The Fine Arts Division is permitted in our facilities. Any use of outside equipment must be approved by the Production Coordinator in advance of use. All Scenery must be hung with approved and rated rigging hardware. The production coordinator or technical director reserves the right to deem any rigging hardware, scenery or equipment as unsafe to hang. Taping of door locks to keep them from locking or slamming is prohibited at all times. All Emergency exits have lighted exit signs and may not be blacked out to block their light during dark scenes. The contact as outlined in the reservation agreement is responsible for any and or all damages to the facility and its equipment. Building structure alterations of any kind are not permitted without the written approval of the production coordinator. Alterations include creating holes, pinning items to seats, painting in or around facilities, taping items to walls or windows and hanging any item on or around the Lemon Street marquee. The renter, at the conclusion of the performance run, must restore any approved alterations to its original condition. Food and drink are not permitted in any Fine Arts Facilities. Bottled water is an exception to this rule. The sale of concessions before, during and after performances is only allowed outside of the building and items may not be brought into any part of our facilities. Alcohol cannot be served or sold without written permission from the Alcohol Beverage Control and the College President's Office.